Crocheting a tablecloth can be intimidating because they are traditionally made as one continuous piece using thread and difficult stitch combinations. This crochet pineapple tablecloth pattern will debunk those worries. The tablecloth is made up of square pineapple motifs using sport weight yarn, and the most complicated stitch is a basic triple crochet. The weight of the yarn is thin enough to allow glasses and vases to stand on the tablecloth without fear of toppling. The yarn, partnered with the square motif, is quick to work up. 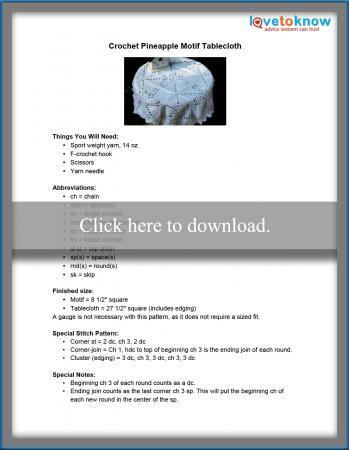 Click on the pattern thumbnail to download and print, or use the Guide for Adobe Printables for assistance. Let this pattern serve as a jumping off platform for a project using similar attributes. Simple changes to the pattern will help you create the perfect custom project you desire. The following are a few tips to get you started. Change the size and shape of your tablecloth by adding or subtracting motifs and adding them in a grid pattern of the shape you are envisioning. This pattern can also be made using thicker or thinner yarn, as well as crochet thread. Changing the yarn weight will change the size of your squares and the thickness of the texture. Choose a hook size compatible with your yarn weight. Thicker yarns may be too bulky to use as a tablecloth but would be perfect for a blanket, pillow, or shawl. Typically, a lacy crochet tablecloth is white or off-white, but the motifs of this tablecloth lend themselves well to checkerboard, stripe or frame designs in contrasting colors. Any crochet edging can be substituted for the tablecloth edging to match you preferences. Even a crochet tablecloth that uses motifs can seem like a daunting task to undertake and finish. It doesn't have to be. Keep a tote bag filled with your pattern, yarn, and hook for those times when you are stuck in the waiting room at the doctor's office, watching a child's sporting event, or for those moments when you just need a few minutes of relaxing crochet therapy.